How to stop patients and clients smoking - guidance on treatments that work, from leading US authorities. 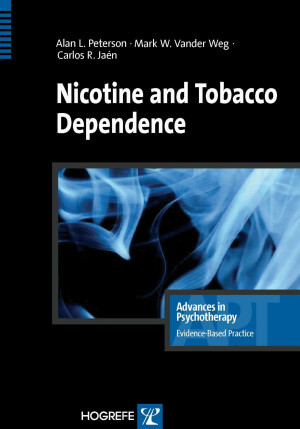 This volume in the series Advances in Psychotherapy – Evidence-Based Practice provides health care providers with practical and evidence-based guidance on the diagnosis and treatment of nicotine and tobacco dependence. Tobacco use is the leading preventable cause of death in the world, and it is the only legally available consumer product that kills people when used entirely as intended. Research over the past several decades has led to the development of a number of evidence-based treatments for nicotine and tobacco dependence that can be delivered by health care professionals in a variety of primary and specialty care settings. This book aims to increase medical, mental health, and dental practitioners’ access to empirically supported interventions for nicotine and tobacco dependence, with the hope that these methods will be incorporated into routine clinical practice. The book is both a compact “how-to” reference for clinicians and an ideal educational resource for students and for practice-oriented continuing education. The volume includes tables, boxed clinical pearls, and clinical vignettes, and the appendix includes clinical tools, patient handouts, and links to the top recommended websites for the download of additional patient materials.
" ... a good resource, not just for psychologists but also for mental health clinicians, medical students, and otherclinicians ... who wish to address and actively treat the leading modifiable behavioral risk factor for death, nicotinedependence." ...provides evidence-based guidelines for behavioral and pharmacological interventions. "The brief intervention strategies mentionedin the treatment chapter can take as little as 10 minutes of the clinician's time but could have a significant impact on patient's well-being." "This 76 page paperback book, plus additional appendices for Tools and Resources, provides helpful advice to quit smoking. [It] is a "must get" for those involved with treating tobacco smokers. I recommend this book to all health practioners and especially those directly involved with tobacco cessation programs." "This is an exceptionally well-written, timely, and informative resource that every healthcare provider must read."